Where is Google’s Income From ? Google does NOT earn money from those IT services and products which we mentioned above. Google is actually operate advertising. Google’s major revenue is from their advertising products such as AdWords. If no ad, Google would not provide so popular free products and services because there would be no money to support. Please check the chart from Mekko Graphics. 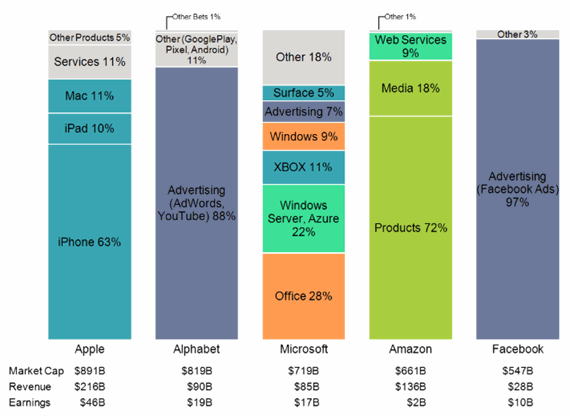 They made the chart in 2018 January for reporting 5 top Tech companies’ revenue: Apple, Google, Microsoft, Amazon, Facebook. Google and Google’s fans call Google a tech company. Now please know: Google is very smart, they use great tech to run their Advertising business to earn money, then invest in technologies. They don’t rely on technologies to get revenues majorly at present, but we believe FREE services and products are just for compositing with other IT giants such as Apple and Microsoft. If advertising can not bring income for Google, they will have to rely on technologies.